Brunello has been facing many challenges recently. It all began when members of the Brunello Consortium considered a proposal to permit the addition of grapes other than Sangiovese to make Brunello. Though the proposal was defeated, an anonymous letter surfaced accusing some Brunello producers of using other grapes, creating a lot of animosity among the members and an investigation by the authorities. Another challenge has been the loss of one of the staunchest advocates for the traditional, all-Sangiovese Brunello, the legendary Franco Biondi Santi who passed away recently at age 91. He prided himself on making wine the way his grandfather did and used his influence to make sure that Brunello would only be made from Sangiovese. His loss has been deeply felt by those who believe in the traditional Brunello. As if there this was not enough, there is also the strange case of Gianfranco Soldera, owner of Cassa Basse. An ex-employee of the winery who did not like the way he had been treated entered the winery one night and destroyed over 60,000 liters of wine by simply opening the valves. Most of the 2006 vintage had already been bottled but almost all of the wine from 2007 to 2012 has been lost. This was a considerable loss since Soldera Brunello sells for over $200 a bottle. Mr. Soldera may have had insurance, however. The Brunello Consortium offered to give Mr. Soldera wine. He thanked them but refused the offer. Later, he made statements to the press about this offer that the Brunello Consortium did not like, so now they are suing him for libel. Following is the press release by the Consortium and its Chairman Frabrizio Bindocci. I think it makes for very interesting reading! The Consortium of Brunello di Montalcino, considering the statements made by Gianfranco Soldera and published by the Corriere della Sera of 26th March last to be highly injurious, has decided to bring an action for libel against Mr Soldera. The suit, which will be filed with the Public Prosecutor’s Office of Milan, refers to the part of the interview given by the owner of the Case Basse Estate where he defined the proposal of the Consortium to give him the “wine of solidarity”, with a different bottle and label, after an employee had drained the contents of his barrels down the drain, as “inadmissible and offensive, a fraud to the consumers”. As underlined by Fabrizio Bindocci, Chairman of the Consortium, “we consider the lawsuit a necessary course of action to safeguard the image of the winemakers, of Brunello wine and of the entire territory of Montalcino. We feel deeply offended and damaged by these and other negative statements on the Consortium and the winemakers made by Mr Soldera following the event that struck him. Our decision was made as a result of the request voiced in unison by the winemakers to take a strong measure against someone who offends the reputation and work of each one of them. This is the only reason behind our decision, and we are very firm in underlining it, once and for all”. Pursuant to the lawsuit, the Board of the Consortium has also decided to immediately expel Gianfranco Soldera, as set forth in the articles of association. Despite his being a resigning member, Mr Soldera would have been part of the Consortium until 2015 – but his highly improper behaviour has determined the incompatibility of his participation in the Consortium. Focusing on the motivation of the lawsuit, Chairman Bindocci wishes to stress “how incomprehensible it is to label as fraud a gesture that Mr Soldera himself, in a press release, had ‘highly appreciated’ ”. The entire phrase spoken by Gianfranco Soldera is: “They wanted to give me their wine: I would have had to bottle it as if it were my own, not knowing where it came from. An inadmissible and offensive proposal, a real fraud to the consumers”. The Consortium stresses that its proposal was meant as a symbolic gesture of solidarity, given that his wine estate had suffered great damage due to the act of vandalism. “We consider it important to point out,” concludes Chairman Bindocci “that the statement reported by Corriere della Sera, as well as the tone adopted by him and his groundless inferences made during that interview, have considerably damaged the image of Brunello and its territory, one of Italy’s expressions of excellence worldwide”. There is something about Paris that makes it special, even in the snow. Our flight landed at 8:20 AM the day after the snowstorm and we did not leave the airport until 11:00 AM. Turns out they were unprepared for snow. The taxi driver got lost trying to find the hotel, not because of the snow but because he did not his way around Paris. By the time we got to the hotel we were tired and cold and the streets were full of slush and ice. But it was Paris, so we made our way to Café de Flore, 26 rue Benoit/Sain Germain-Des-Pres. 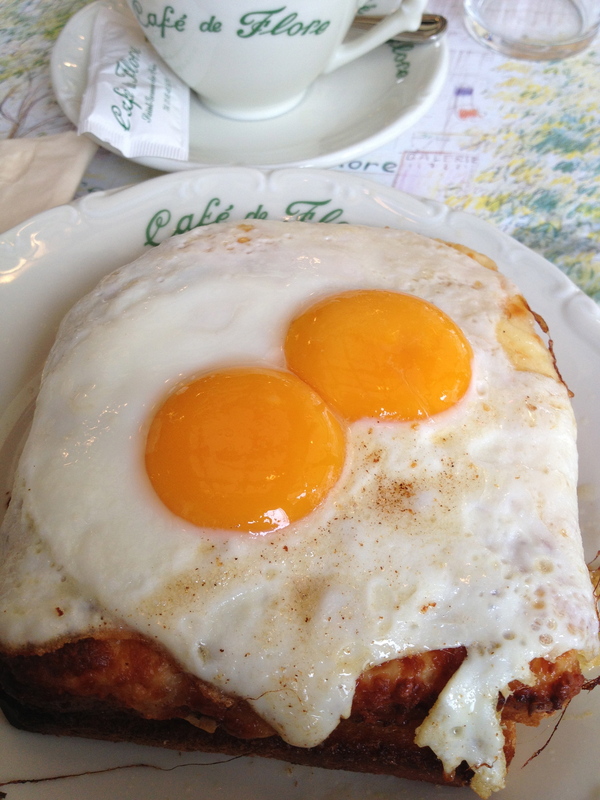 I had the La Jockey (Croque Madame) and Michele had quiche. This is a very popular place both with the French and tourists and there are so many interesting people to watch. By the next day the snow was gone and we went for a walk toward Les Halles. We passed a small restaurant that resembled an old Parisian Bistro and I looked in the window. The décor was old fashioned and kind of shabby and the menu on the chalkboard outside looked great, plus it was inexpensive. We kept it in mind and a few days later we went for lunch. 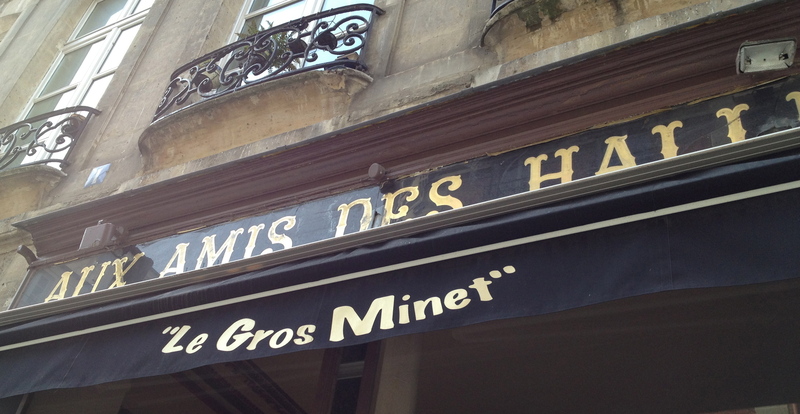 Le Gros Minet 1Rue Prouvaires (+33 1 42 33) is a family run restaurant. 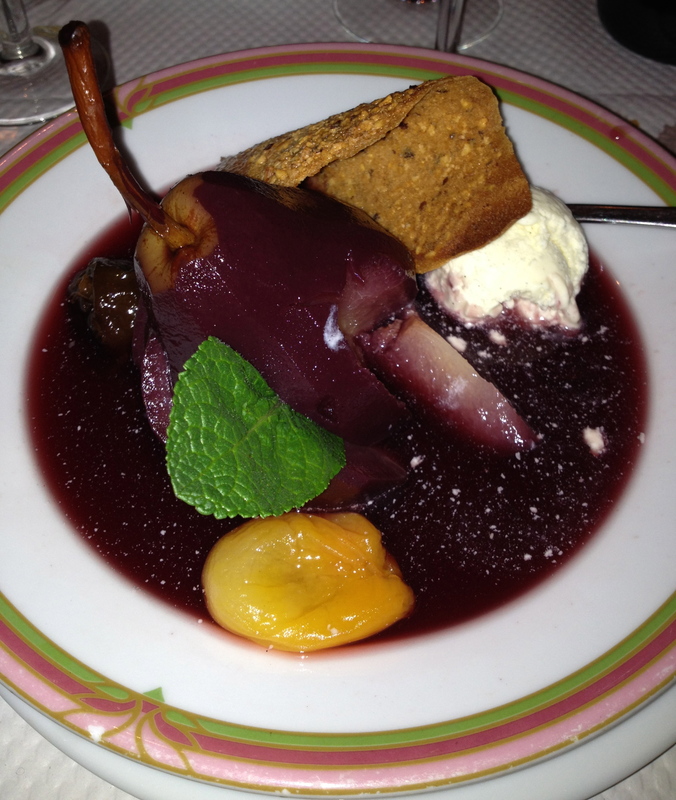 The food is simple in the style of Southwest France but very good and the bread is excellent. The staff is friendly and the service is attentive. There is a choice of house wines. I ordered a Cote Du Rhone and I could not believe how good it was, though I never did find out the name! I had kidneys in a mustard sauce and Michele had a salad with foie gras. When the taxi arrived at Taillevent, 15 rue Lamennais (www.taillevent.com), two men opened the doors and escorted us into the restaurant. Inside there was a gracious welcome. We were escorted to a very comfortable table and settled in with a glass of champagne. I do not have any pictures because one does not take pictures at Taillevent! The food was excellent as was the wine and the service. The menu at lunch changes every two weeks, so I will not write about what we ate. But for dessert it was Paris Brest, basically a cream puff pastry with hazelnut filling. It was so delicious. The meal ended with a glass of Armagnac. The meal was expensive but I have paid more in restaurants in NYC that were not as good. This was a very special experience. One chilly and rainy night we made our way to Restaurant Chez Paul at 13 rue de Charonne. (+33 1 47 00 34 57). This is a traditional Bistro, very cozy and very crowded. Michele had made a reservation on line but when we got there the gentleman at the desk said they did not have the reservation. After a few awkward moments, he smiled and seated us at a table close to the bar. From now on we will always confirm our reservation that we make on line by phone when we arrive in Paris. 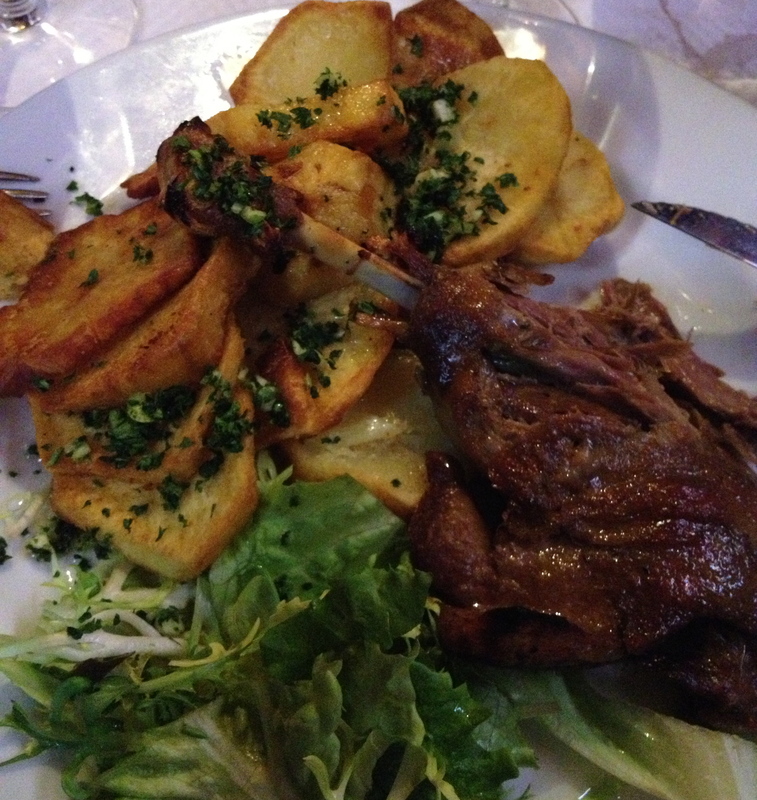 I had an excellent confit of duck with apples and garlic and Michele had Steak au Poivre. For dessert Dèlicieuse poire au vin èpice et vanillè. It was, as it name says, delicious and it is the house specialty. We drank the Domaine Milan Les Baux de Provence Clos Milan Rouge 2005 made from 75% Grenache, 20% Shiraz (Syrah) and 5% Cabernet Sauvignon. The grapes come from vines that are at least 40 years old that grow in quaternary sands and gravels. The grapes are destemmed and fermented in cement tanks for about three weeks and then aged in old barriques for a further 12 months. La Regalade now has two locations. The original at– 49 Jean Moulin and the other at 123 Rue Saint Honore (+33 1 42 21 92 40). 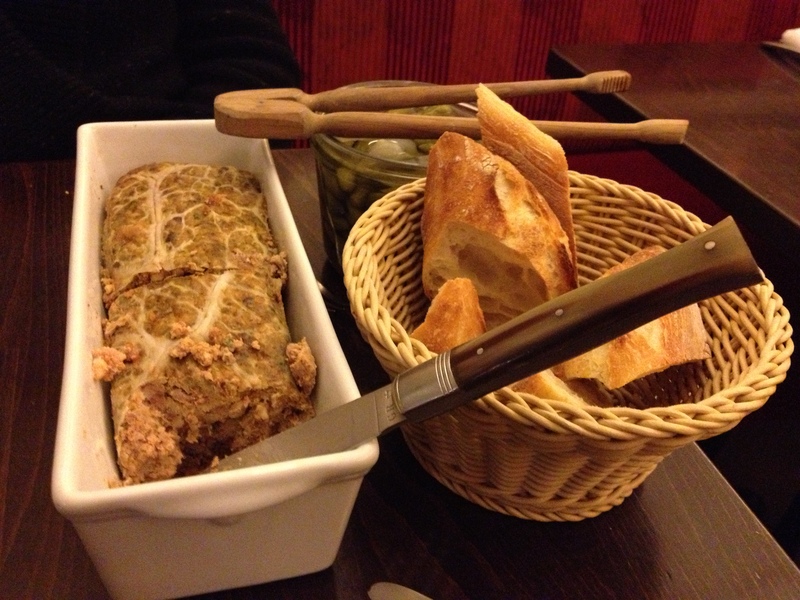 Both locations start you off with a large terrine of pate de campagne and a crock of cornichons with bread that is toasted and crunchy. It is almost a meal in itself and delicious. The first night we went to the one on Rue Saint Honore because it was close to the hotel. 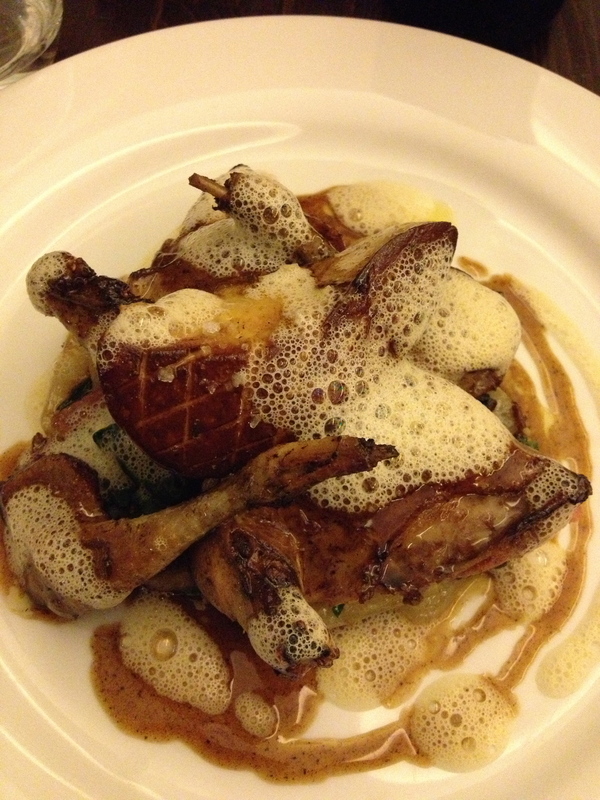 The food was good but the pigeon I ordered was covered with FOAM. This was completely unnecessary, did not add anything to the dish, in fact it distracted from it. We had a nice bottle of Cahors 2009 Château du Cadre.Made from 90% Malbec, 5% Merlot and 5% Tannat Fermentation is between 30 and 35 days with with pumping down at the beginning of fermentation. Malolactic fermentation takes place in barrels. Aging for 22 months in oak barrels (Troncais) of different ages. The wine is not filtered. 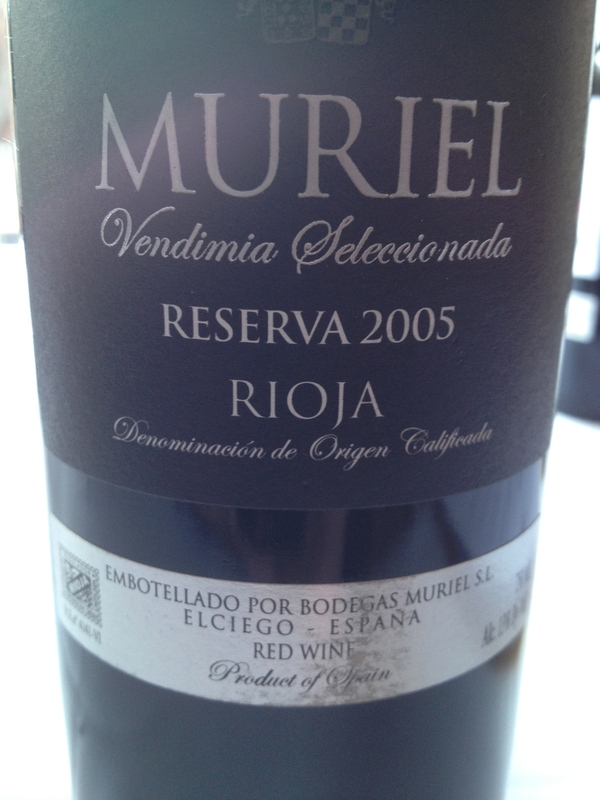 It has black fruit aromas and flavors and a hint of spice. We went to the original La Regalade a few nights later with a French friend who lives in NYC but is working in Paris for the next six months. We went by Metro and she carried her dog in a cloth basket on the train and brought it into the restaurant. The dog was very well behaved and was given some water by the waitress. The food was good but again the FOAM, this time on my pork. 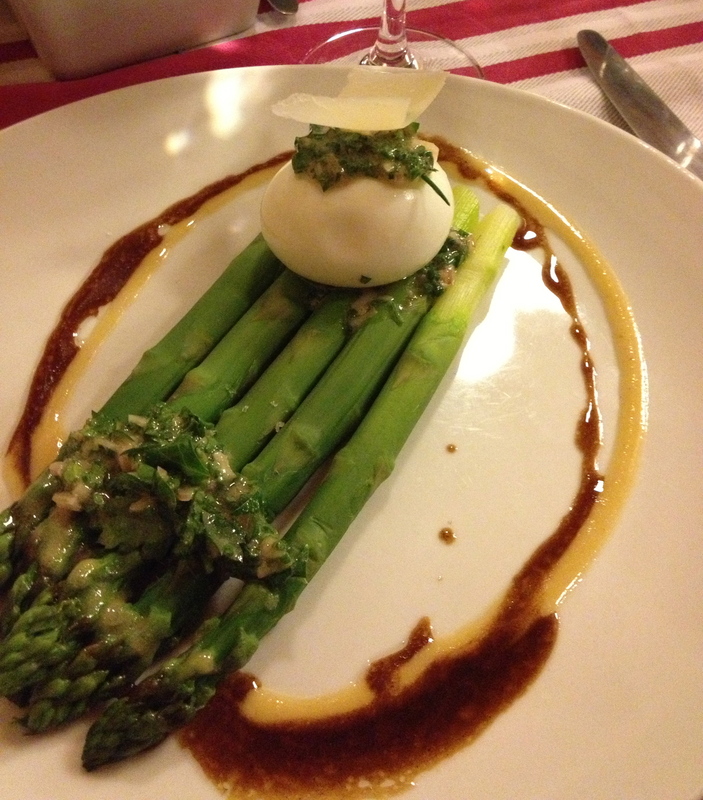 Michele had a perfectly cooked egg on a bed of asparagus topped with a thin slice of cheese wich she really liked. 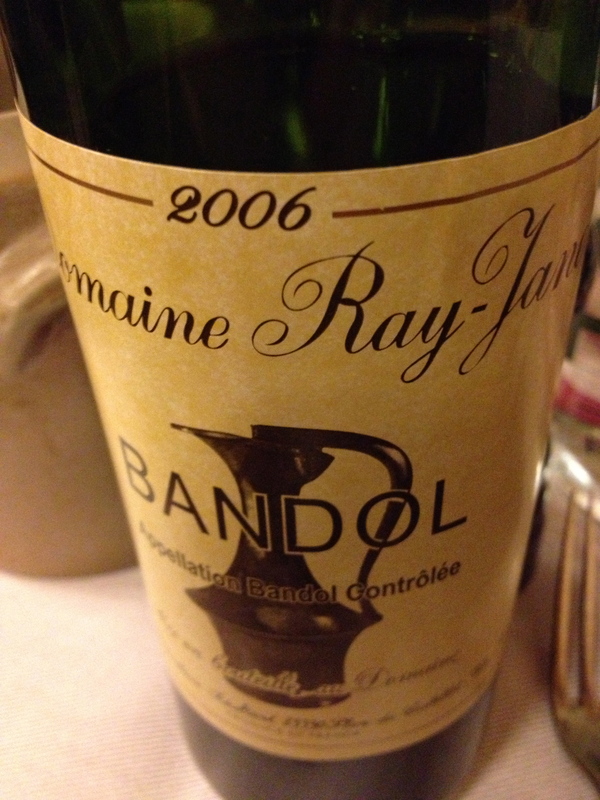 We drank a bottle of Bandol 2006 Domaine Ray-Jane. 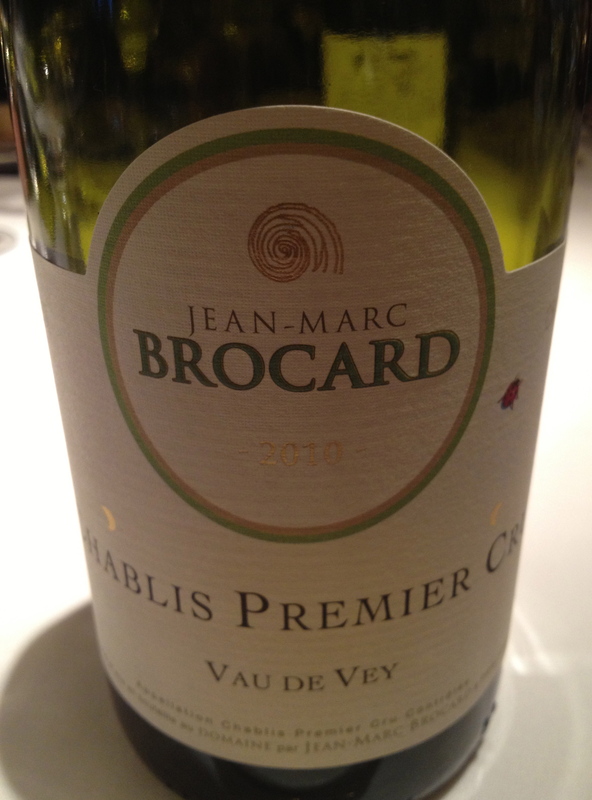 I believe the principal grape is Mourevdre and it went very well with the food. We stayed at the Hotel Molière, 21 Rue Molière(+33 1 42 96 22 01) on the right bank. This is a quiet family run establishment with very nice rooms. The highlight however was the bathroom; it had a large walk in shower, a big bathtub, a long trough-like sink and more light than any bathroom I have ever been in before. The hotel was in a good location because it was in walking distance of many of our favorite restaurants. Michele really enjoys the atmosphere of this classic Parisian bistro. Usually we order the same dishes each time we go but this time we ordered foie gras to start instead of the Salade Frisee aux Lardons we usually get. 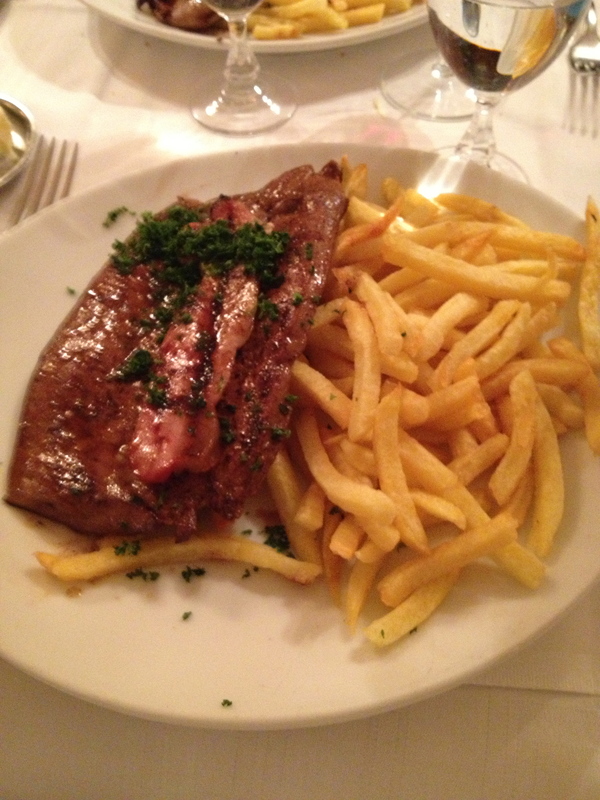 Once again we ordered calf’s liver al anglaise fried in butter with a big thick slab of bacon on top, and frites. Since it was our last night we added a cheese course. For dessert, as usual we ordered the Tarte Tartin, an upside down apple tart accompanied by a large bowl of extra thick crème fraiche. Crozes- Hermitage 2010Domaine Saint-Clair 100% Syrah. This was a lovely red wine that went very well with the food. L’Ardoise 28 Rue due Mont Thabor (+33 I 42 96 28 18) We had a very nice meal here but the food came out too quickly and the place is small and cramped. 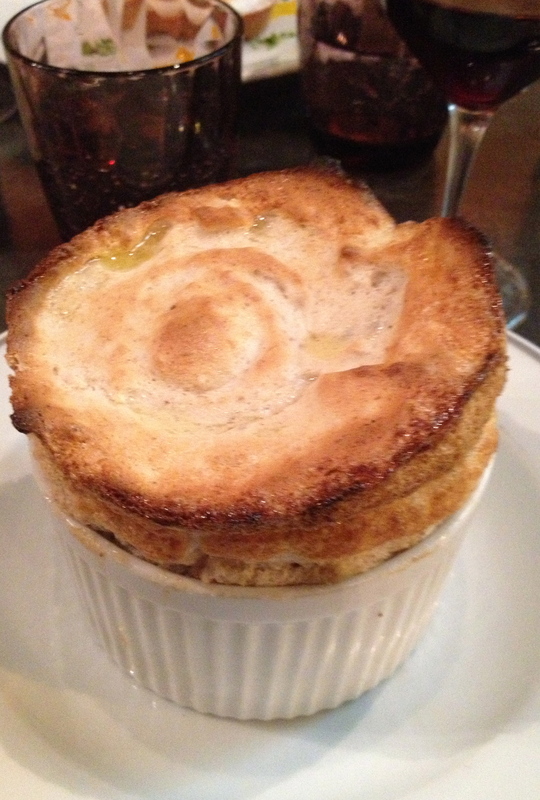 The most memorable dishes were the desserts, a chestnut soufflé and a lemon meringue tartlet. Jaques Genin 133 Rue Turenne. 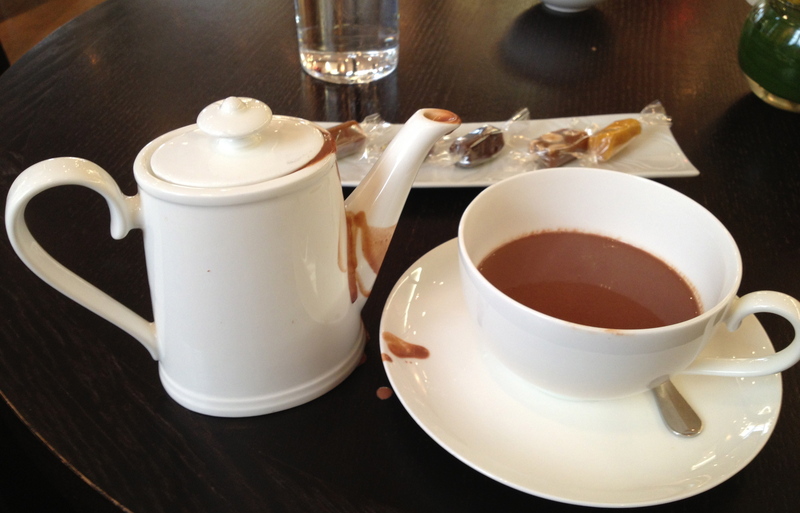 It was cold in Paris and what better way to spend part of the afternoon than in a beautiful place enjoying a hot chocolate. We drank hot chocolate and munched on bite sized chocolates and caramels. The caramels are expensive but well worth it-they are indescribably delicious! 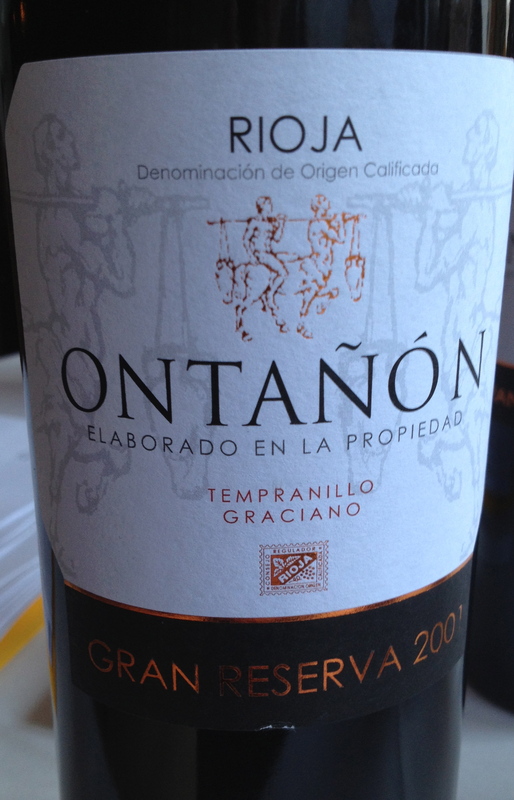 Red wines from the Rioja region of Spain have always been great bargains. Both current vintages and older vintages that can age well. When the Wine Media Guild organized a tasting and lunch featuring Rioja, I decided to attend in order to learn more about the wines. The speaker was Ana Fabiano, a leading authority on the wines of Rioja and the author of a very comprehensive book, The Wine Regions Of Rioja. Ms. Fabiano told us that the Rioja wine region extends out of the La Rioja area and into Álava in the Basque country in the northwest and Navarre in the northeast. 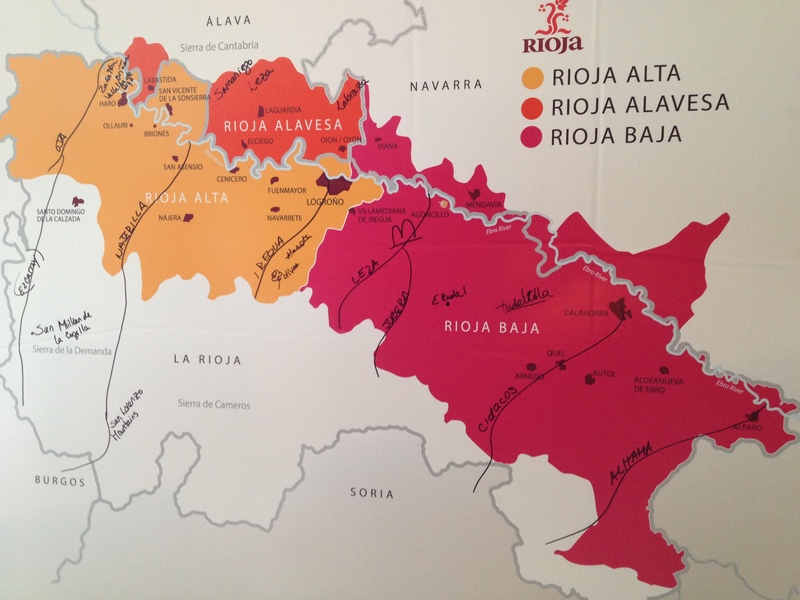 There are three subdivisions: Rioja Alta, Rioja Alavesa and Rioja Baja. Each has its own geography and characteristics, but the terrain, including rivers, valleys and mountains, unites the overlapping regions and subregions. All of Rioja’s vineyards are in the Ebro River Valley or one of its tributaries, but the soil and character vary greatly. Some vineyards are on terraced slopes of the alluvial plains and others on the iron-rich soil of the mountains. The Ebro is the longest river in Spain and Spain is the most mountainous country in Europe after Switzerland. In the last 15 years more new Bodegas have been founded in Rioja than in the last 150. It was the tradition to use American oak in Rioja but many of these new producers along with some older established ones prefer to use a combination of American and French oak. Ms Fabiano divided these producers into two groups which she calls “Classics” and “Modern Classics.” Ms. Fabiano said that by law all the barrels used in Rioja must be 225 liters (barriques) and some bodegas still employ coopers on site. Rioja law also requires that only indigenous grapes are planted in the vineyards of Rioja. The red grapes are Tempranillo, Garnacha Tinta (Grenache), Graciano, Mazuela and Maturana Tinta. 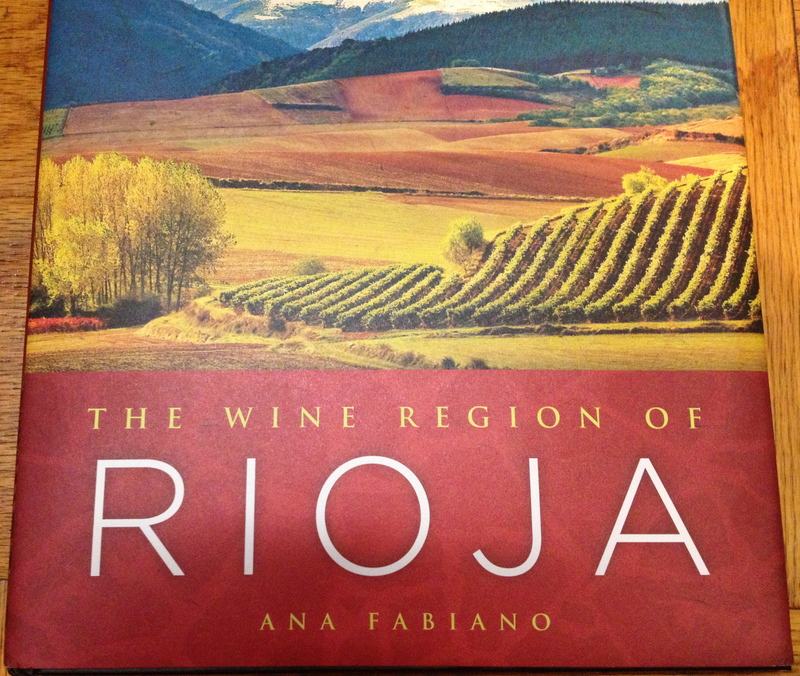 For more information on Rioja I recommend Ms. Fabiano’s book The Wine Region of Rioja. 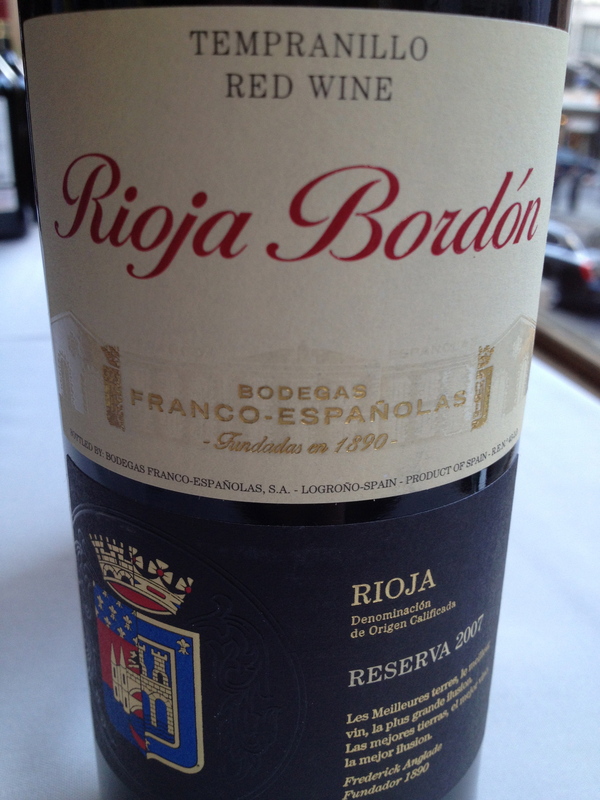 Rioja Bordón Reserva 2007 Franco- Españonias made from 80% Tempranillo, 15% Garnacha and 5% Mazuelo. By law Reserva must be aged in oak for one year and two years in the bottle before release. 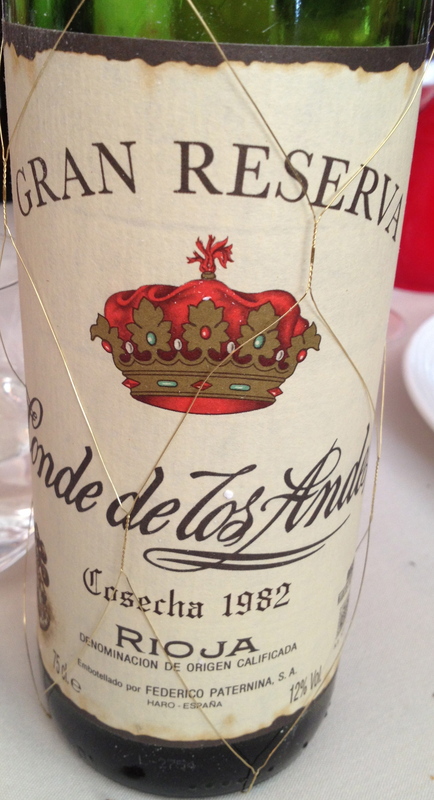 By Law Gran Reserva must be aged two years in oak and three years in bottle before release. Every year for Easter dinner, Michele makes roast leg of lamb. This year, however, she decided to make chicken because one of our guests does not eat red meat. The Pat La Frieda chickens that we buy at Eataly in NYC are expensive but very flavorful and perfect for the way Michele prepares them. 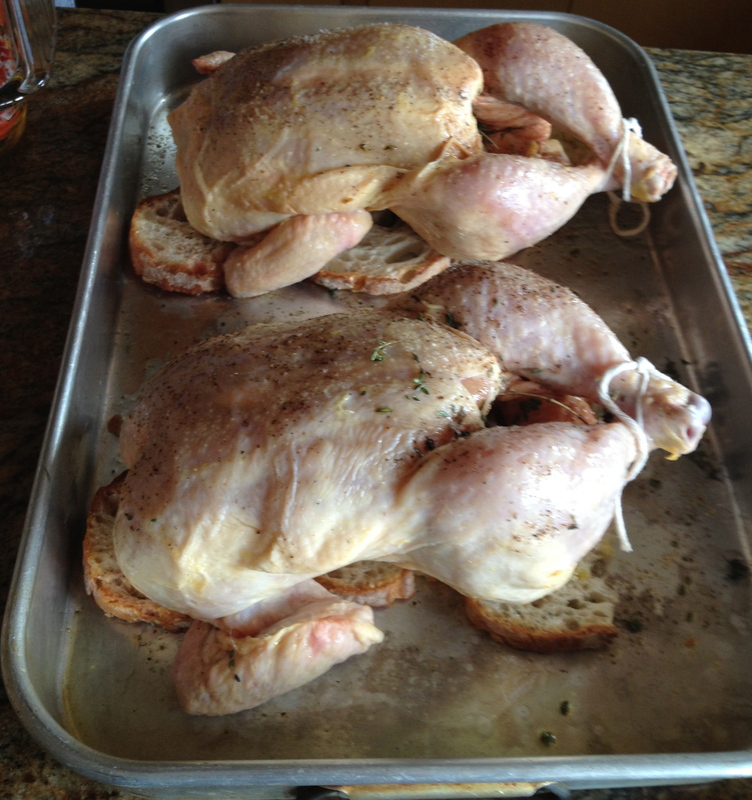 She stuffed them with herbs and roasted them on slices of garlic-rubbed ciabatta bread to catch the chicken juices. The chicken and the crunchy bread are eaten together. For an appetizer, there was a salmon mousse, perfect with the Champagne. 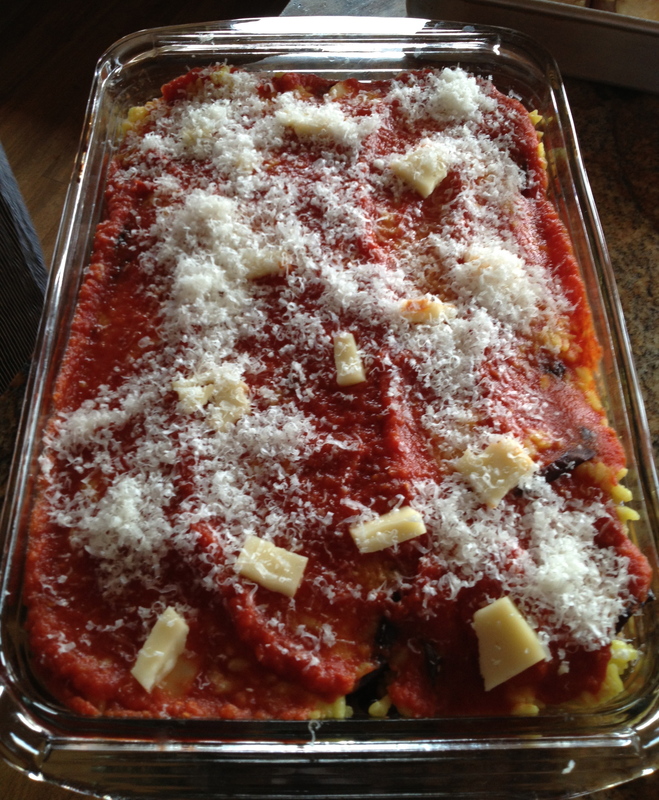 The first course was a timbale of rice and eggplant. 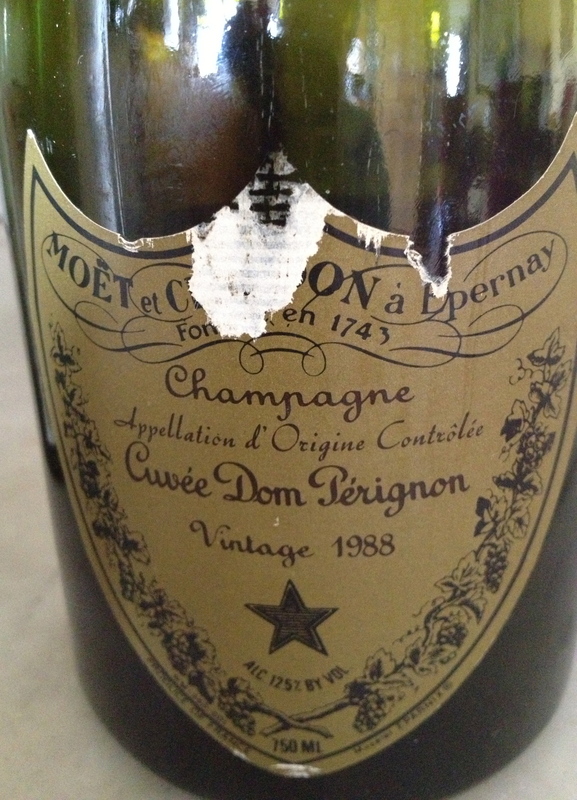 Cuvee Dom Perignon 1988 made from equal amounts of Chardonnay and Pinot Noir. The grapes come from five Grand Cru villages and one Premier Cru village. Ed Mc Carthy supplied the wine and this is what he says about it in his book Champagne for Dummies – the wine’s “…trademarks are its exquisite balance, its creaminess, its elegance, its very fine tiny bubbles and it complex flavors.” He was also right on the mark when he said, “With age, Cuvee Dom Perignon develops aromas and flavors of toast, coffee and honey.” He said that 1988 was a great vintage. 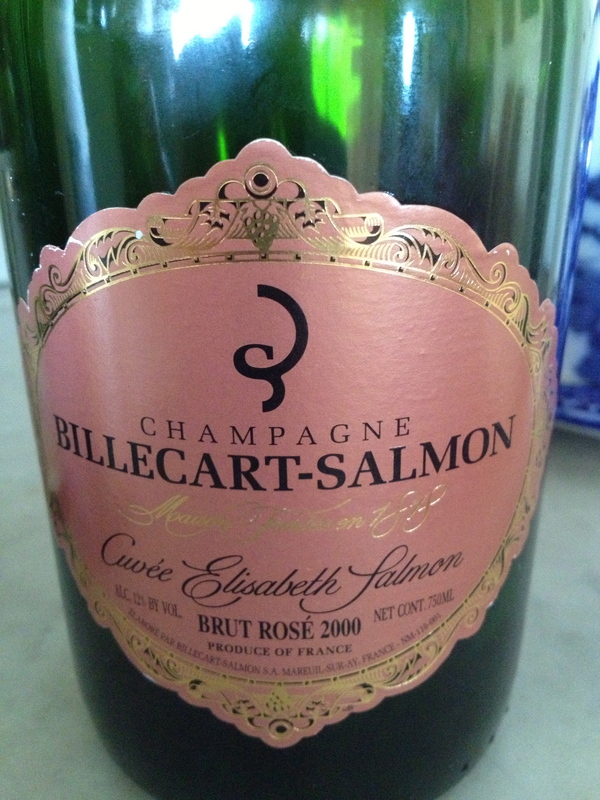 Billecart-Salmon Cuvée Elisabeth Salmon Brut Rose 2000 Made from 58% Pinot Noir and 42% Chardonnay. It was light salmon like in color, light bodied for a Rosè , fresh, delicate and elegant. I should have served the Billecart before the Dom Perignon, as the Dom was a bigger wine. Chateau La Mission Haut Brion 1988 (Graves) 60% Cabernet Sauvignon, 35% Merlot and 5% Cabernet Franc The wine spends 18 t0 22 months in oak barrels of which 80% are new. Classic Bordeaux and could have used a few more years of bottle age. Latricières-Chambertin Grand Cru 1971 100% Pinot Noir Domaine Louis Remy. 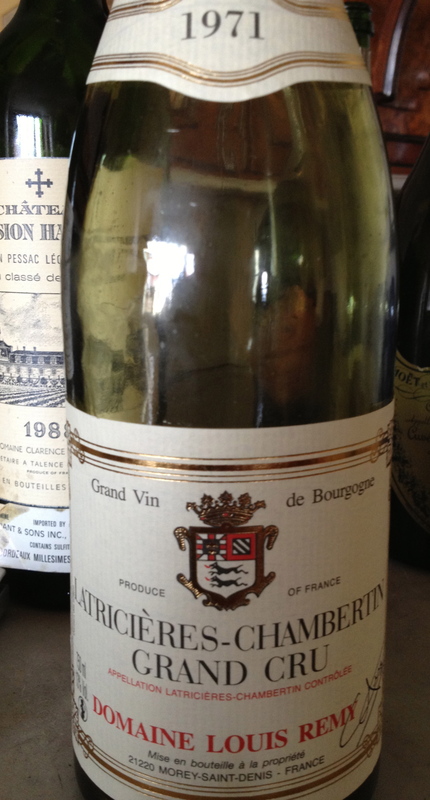 This was classic Burgundy showing no signs of age and went very well with the chicken. 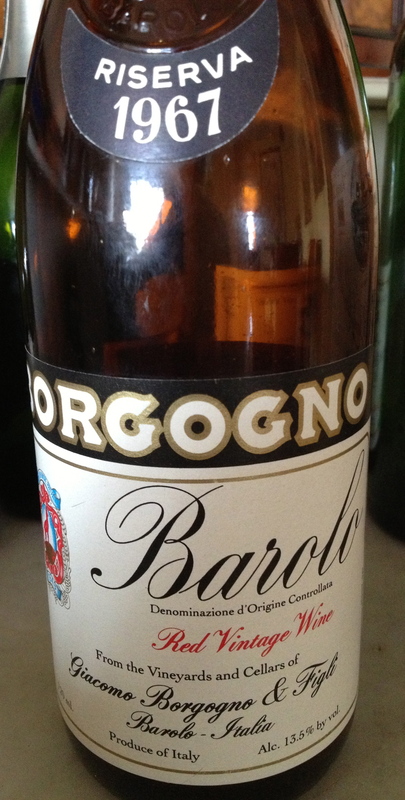 A few days earlier I had a 1958 Borgogno that was in perfect condition and even seemed young and had not been recorked. There are no great wines, only great bottles of wine. This was served with the timbalo of eggplant and rice. 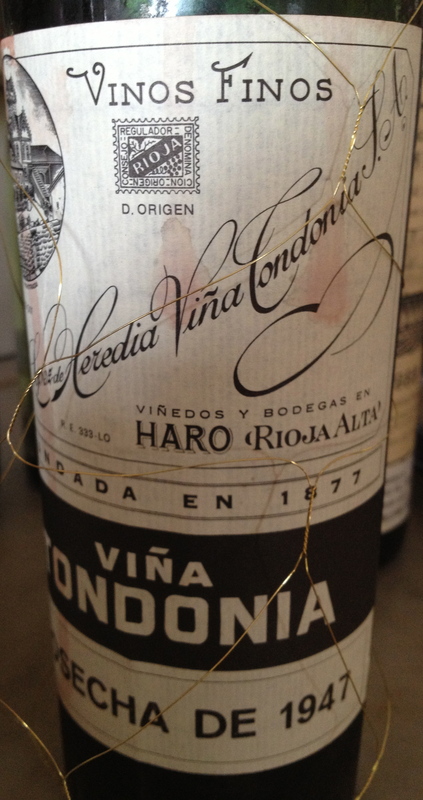 Rioja “Viña Tondonia” Rioja Alta 1947 R Lopez De Heredia 75% Temparillo, 15% Mazuelo and 10% Giaciano all from their own vineyards. The soil is alluvial clay with a high proportion of limestone. Harvesting takes place in October and is by hand. They use French barriques along with barrels ranging in size from 60hl to 240hl. The oak comes from the Appalachian mountains in the U.S.A. This is one of a handful of wineries that make their own barrels. They use oak casks to ferment the wine as they use completely natural traditional methods of wine making. The wine is aged in barrels for 10 years, racked twice a year and fined with egg whites. The winery is over 136 years old. A piece of stone had been placed in the middle of the table at the Gotham Bar and Grill in New York City where I was attending a Chablis tasting. It looked like a piece of limestone with tiny pieces of white shells imbedded. 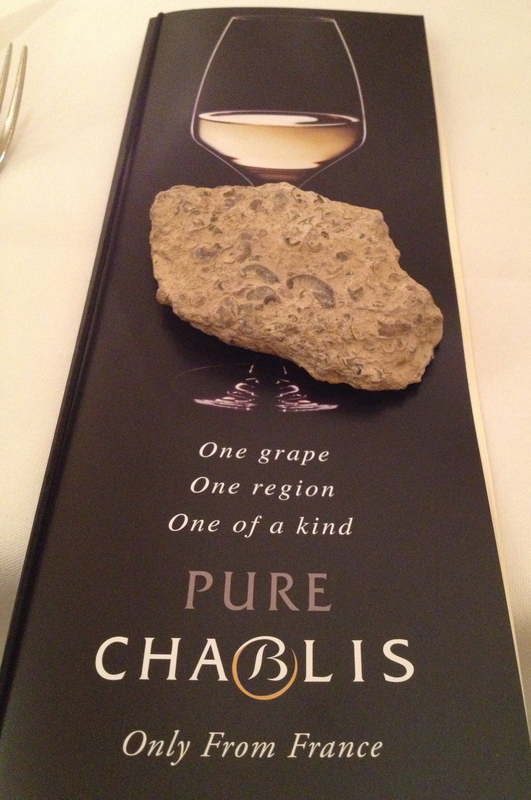 I guessed that it was a chunk of the famous soil of Chablis, which gives the wine its unique minerality. The two speakers at the tasting were introduced as “Chablis Ambassadors” Jean-Francois Bordet, President of the Chablis Wine Board. He is the 13th generation of his family to run the Séguinot-Bordet Winery, and Christian Moreau, a leading producer of Chablis and a man that I have heard speak over the years. 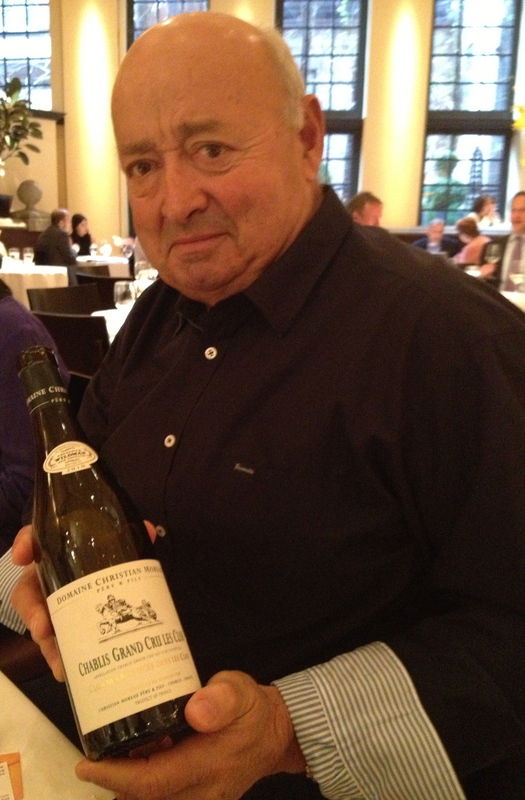 I have great respect for his knowledge of Chablis. There were only 4 journalists at the lunch so we were able to really get to understand Chablis. Both Chablis and Chablis Premier Cru are a very good value for the money. 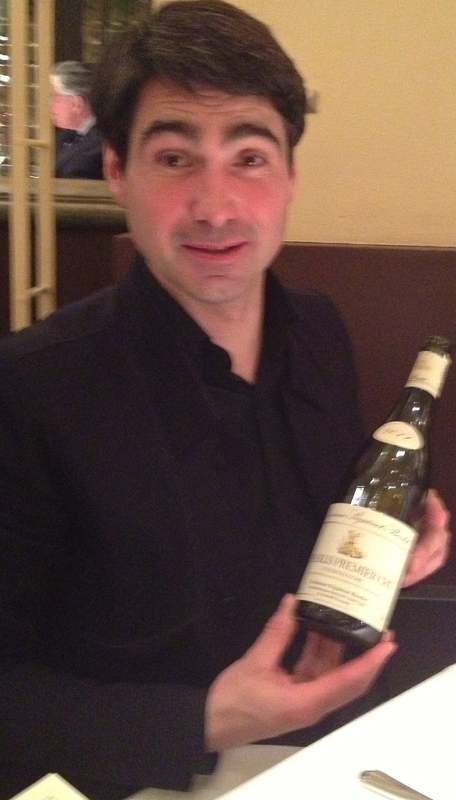 Chablis Grand Cru is a bigger, richer, rounder wine with more depth but even at $100 a bottle it is worth the money.